KineMan is the ultimate web application for learning and demonstrating human joint behavior, and for creating complex human poses. Unlike any other online human anatomy/kinesiology model or mannequin app, KineMan allows YOU to move the joints: simply, precisely, and realistically. You can select from over 100 joints (and 170 degrees of freedom), and move them simply by clicking & dragging on the skeleton. You’ll observe biomechanically-realistic behaviors, owing to movement parameters (like ranges of motion) derived from scientific sources. Plus, you can position and view the body from any angle, while quickly identifying more than 200 bones, described using precise scientific names & common names. Bones are rendered using high-definition bone shapes, with realistic 3D illumination and accurate perspective (thanks to WebGL graphics). At the same time, KineMan is easy to use. You can: identify bones by hovering, select joints to move by clicking on them, and move joints by dragging across the viewing area. Or, move the body or joints using ‘smart’ sliders. You can experiment and iterate, thanks to Undo or Redo buttons. Documentation includes embedded 'Hints' & tooltips galore, plus extensive online Help. You can make your poses highly expressive, by incorporating hand & foot joints. Or, replicate poses accurately, by tracing from images. Plus, utilities enable you to save your poses & share them with colleagues, or save them as images, optionally with transparent backgrounds. Observe complex joint behaviors not possible using other media, including cervical bending & scapulo-thoracic sliding. Reinforce vocabulary (bone & joint names, kinesiological movement terms). Interact dynamically (unlike coloring books). Explore spatial rotations in terms of Euler angles. Create attractive, convincing graphic displays for online or print media. Integrate with other media, via transparent backgrounds. Present live demonstrations smoothly, using quick positioning controls, saved poses, and ‘group’ joints. Focus attention by hiding or isolating bones. Share poses with colleagues, students, friends. Educate patients re: orthopaedic conditions. Create specialty images, using comic rendering mode. Simulate action poses not possible by human models. Evaluate complex postures or gestures from any angle. Synthesize highly expressive poses, by incorporating articulated hands and feet*. Create any conceivable pose, using 6 degree of freedom body positioning and unlimited range of motion*. Quickly identify bones by scientific or common name. 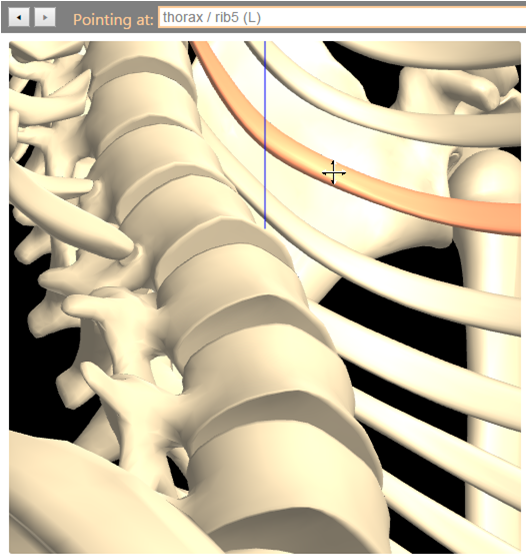 Lookup joint motion parameters, bone shape & size details, & more. Measure angular displacements using calibrated sliders. Evaluate spatial relationships, with true 3D perspective. It’s a web site, so it’s there when you need it. Usage: Personal use Professional, academic, clinical, and public use. Is your computer KineMan compatible? * KineMan uses the WebGL capabilities of your browser to display 3D graphics. For best results, you should use either Firefox or Chrome as your browser, and your computer should have a modern graphics processor (GPU). Please see the Help/Requirements section for further information. 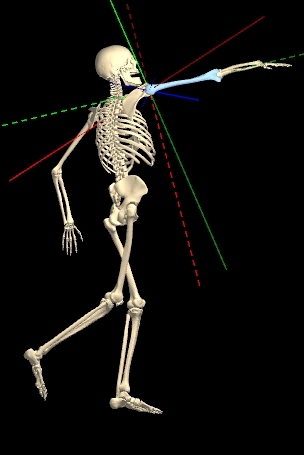 Original bone data created & licensed by Longchamp Labs/21st Century Solutions Ltd; FFI see www.anatomium.com. Bone & joint data file formats and content are copyright Neosim R&D.